2012: The Year in Awesome. Yes, it was awesome. Readers may have noticed that I do not post much about fine dining in Budapest. That is simple to explain. Such dining may possibly exist, but I don't know about it. Eating out in this city has become wildly expensive, and so much of what you are paying for is mediocre and made from the same ingredients you can buy at Tesco, so why bother? Most of what we eat out is food from nearly anonymous lunch places, such as those in the Chinese market. We also discovered the Turkish kebab joint near the Chinese market that serves as a weekend hostel for Turkish bus and truck drivers on Orczy ut near Orczy ter. Fresh baked pide and lahmacun! 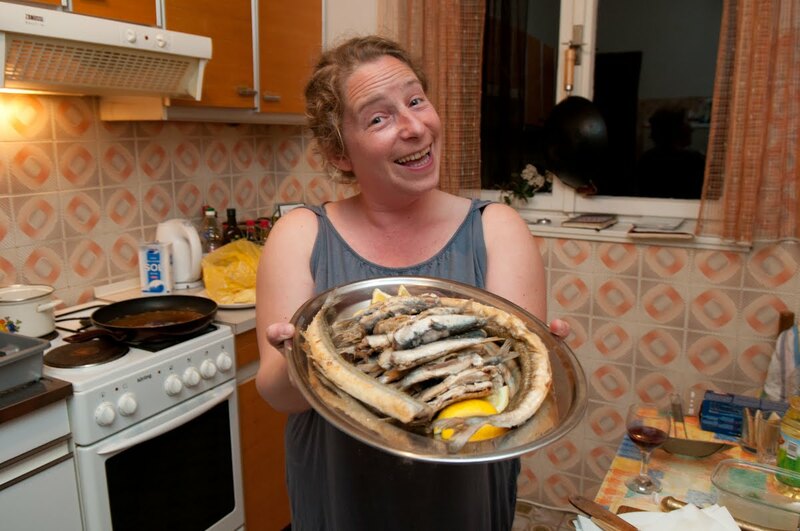 Baked fish! Look at the faces of these Anatolian truck jockies. Awesome! This year involved a lot less travel than most years. I got to take Fumie along on a fantastic short trip to the Netherlands for the Tilburg Gyspy festival. She stayed with our good friends Hans and Vera and was able to experience a lot of what makes the Netherlands one of my favorite places in Europe: cheese. I, on the other hand, stayed in a cinder block hotel along with all the other musicians. Sure, a lot of you may think that sitting in a tiny garden smoking area with Taraf des Haidouks, Kocani Orestar, Lajko Felix, and the Manyo Band chain smoking and drinking coffee is the high point of a life well spent. For us, its just life. So much life, in fact, that when I got home I bought some nicorette (which is awesome!) and quit cigarettes. 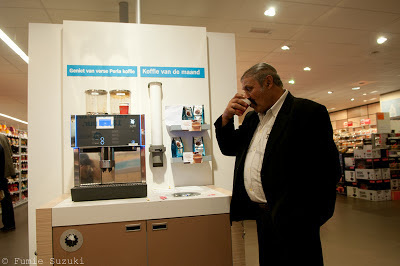 On the other hand... you can get free espresso coffee in Dutch supermarkets. If you are a Gypsy drummer from a Hutsul village in the Ukraine you would definitely have to label this social advancement as... awesome! Personal triumphs were not lacking during 2012. Aron graduated from High School and entered University. He participated in that very special Hungarian assault on teenage personal dignity known as the ballagas, or graduation procession. Of course, he's the one nonconformist in his line. Wedding vows were all over the effing joint in 2012. Tom Popper finally tied the knot with somebody exponentially more intelligent than himself, Amy, during their temporary exile in the US. They are promising to retie the knot when they return to Budapest. We salute you, Amy, for daring to do what so needed to be done, no matter how messy and unpleasant it may seem to others of weaker stomach and fortitude! All kinds of awesome! Long time readers of the blog will be familiar with our Croatian representatives: Captain Squid and Mamselle Fifi la Squidette. 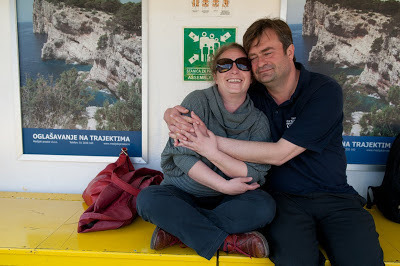 They tied the knot on the island of Vis in March, which was a wonderful trip that officially ended our experience of Winter, 2012. Fumie was a witness at the ceremony, which was held on the island of Vis in the spirit of Marshall Tito and his Partizan forces, and celebrated with a twelve hour Croatian feast at the Pojoda restaurant. Simultaneously epic and... awesome! Then they promptly moved to Singapore leaving us here in the Northern Balkans (yeah, that's what I called it. So there!) without our trained personal fish chef and vacation base. This made us very sad. While the Squid Clan was halfway around the world gobbling Perankan pepper crab and laksha noodles, all we retain are mere memories of jumbo squid and green fish bones. Elsewhere in Hungary, awesome moments were sparse and hard to find. Often, our friends from abroad had to get on long transatlantic flights in order to import elements of awesomeness to our awesomeness-deprived adopted homeland. DJ Socalled - Josh Dolgin - finally made it to play a gig at the Akvarium Klub in downtown Budapest, but when local channeller of awesomeness Flora Molnar took the challenge to rap on stage with Josh, our quota of Judeo-awesomeness (awesomekeyt in Yiddish) was filled for the year. After the gig we took the band for a dip at the Szechenyi Baths, which, if you are a touring musician with a free day off in your schedule, meets most of the qualifications for awesome! One of the best things about Klezmer musicians is that they do not live in terror of taking a bath with a thousand other people. Try that with a bluegrass band someday. And afterwards we enjoyed a meal of the very best shnitzel sandwiches in Budapest, served across the street from the baths at the snack bar attached to the old bar next to the circus. Its a dump. And the bench we were sitting on fell apart while we were sitting on it. Awesome! Let me see... what other outstanding moments have come to fruit in the year 2012? Oh! Of course. The disovery of beef-based Polish Spam for sale at the Bosznyak ter market! At the horse meat sausage and salami stand, no less! Awesome! Given the relative scarcity of fresh ocean fish around these parts, lovers of colloquial Okinawan-Hawaiian teriyaki spam sushi jumped for joy with the ready availability of spam musubi! What? You do not think that spam belongs in sushi? You are wrong. This is possibly the national lunch snack of Hawaii. 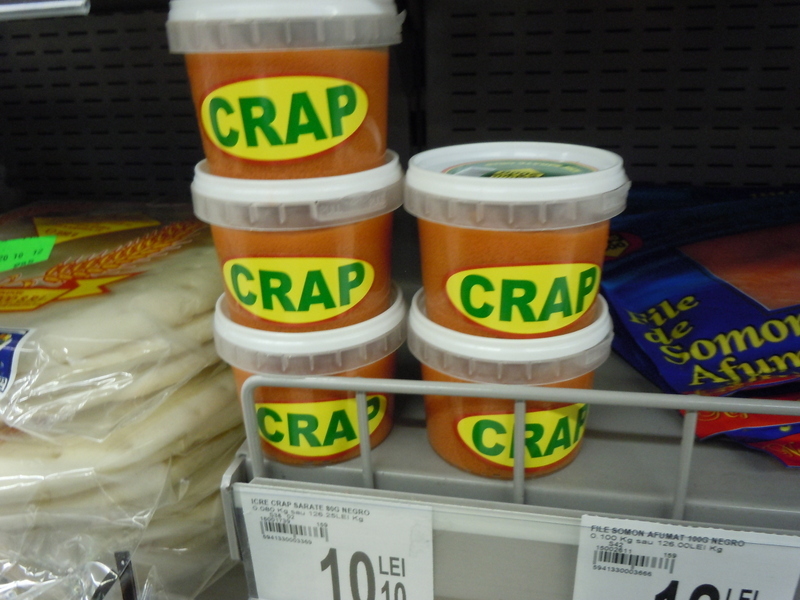 This is why you see huge earthworklike piles of spam at Asian supermarkets. There is something about spam and seaweed and soy sauce that says "processed meat is gooood for you" like noth else. And this summer's big awesome surprise was meeting up with Rick Goldstein and family on their way to an enjoyable vacation of flinging themselves off of cliffs in Slovenia. Rick was my old high school buddy and we hadn't seen each other since the late Neolithic era. We backpacked together around Hungary and Romania for a couple of months back in 1973, getting serially arrested by the Romanian securitate as spies, albeit only slightly post-pubescent spies (three times, in fact.) I promised to show them the best of Budapest. And I did. I took them to the Chinese market. Awesome! 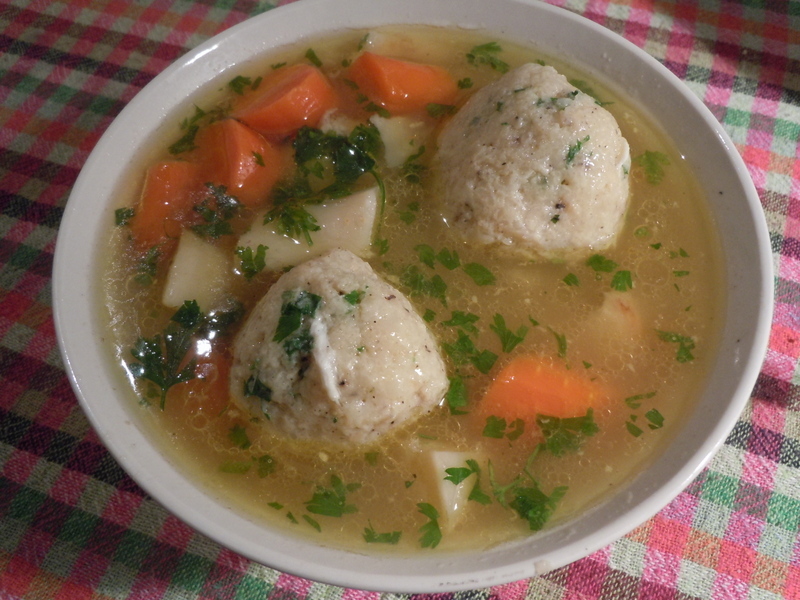 Further evicence of 2012 awesomeness is Matzoh ball soup. Not just any Yiddish yukh mit kneydelekh, this is what I eat almost weekly, made from pure chicken or mixed chicken and beef broth prepared by Fumie (who also makes a separate Asian style broth for our Fake Vietnamese pho or our less than fake but still pretty iffy ramen experiments) and my masterful matzoh balls. The secret? Do not use matzoh meal or mix. Simply crush whole matzoh (paszka in Hungarian. They use it to stuff chickens.) mix with egg and some chicken fat from the soup, salt, pepper, parsley... form into balls and boil. Awesome!